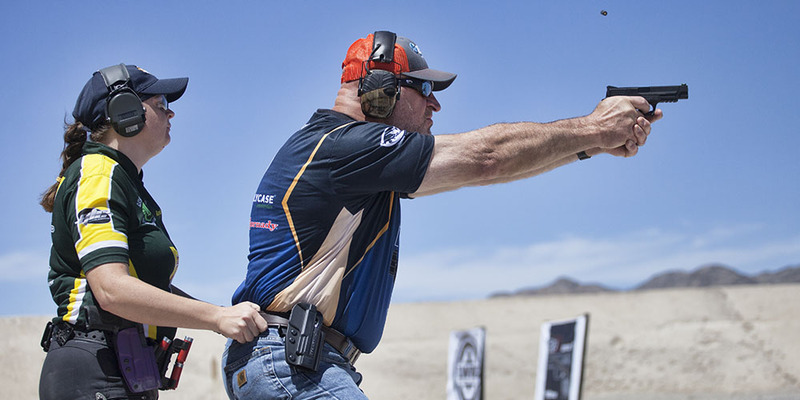 Seven pros at the National Shooting Sports Foundation (NSSF) Fantasy Shooting Sports Camp in April offered different techniques, tips and perspectives to the shooters who attended. 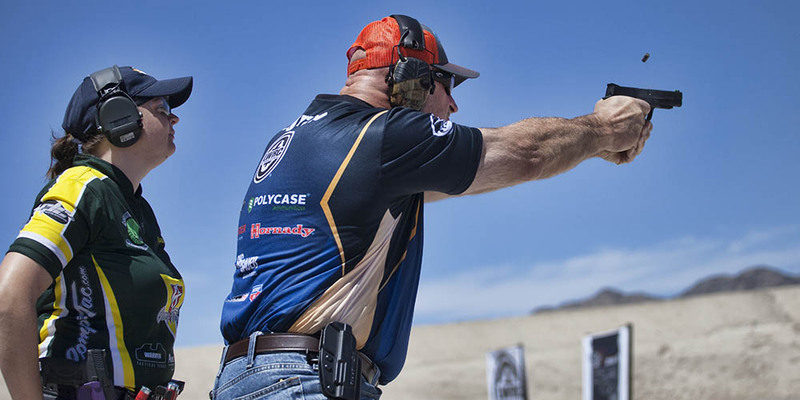 Here’s a little of their 3-gun wisdom, and how you can get better, faster and more accurate with your firearms, regardless of pursuit. One single statistic does a better job describing how impeccably the NSSF organizes its new Fantasy Shooting Sports Camps than words. Of the 29 participants at April’s camp, seven attended the first one—learning how to run three guns this time, instead of just one. I’d wager all 29 would have been repeats if work and family schedules were accommodating, but I couldn’t find a casino while I was in Vegas dumb enough to take that bet. The attendees were picked up at the airport, shuttled to Aliante hotel, and driven to the Clark County Shooting Complex every day. They enjoyed catered meals, and everyone went home with a prize and awards were given. During the day, they ran through as much of the provided ammo as they wanted under the watchful eyes and guidance of world-class shooters, with a hot, catered lunch sandwiched between. It was better organized than a SEAL raid. The real attraction, though, was expert instruction from some of the industry’s finest. It’s amazing how willing they are to share their knowledge and experience on the range, and this event was no exception. Celebrity shooters at the event included Chris Cheng, Dianna Muller, Ryan Muller, B.J. Norris, Randi Rogers, Tommy Thacker and Robert Vogel. Their credentials are long and skill speaks for itself. 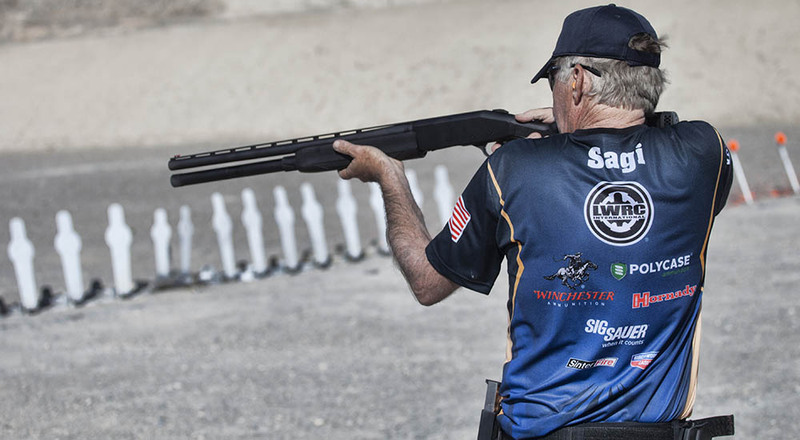 Shooters practiced six different stages—with a pro stationed at each to time, offer tips and serve as range safety officer—rotating to each on the first day of camp. It gave everyone a chance to try slightly different techniques as recommended by skilled instructors, and ultimately, decide what worked best for them. The second day, teams were assigned and the same stages were practice, but with a single coach this time. The day ended with a final match between the teams. Before you ask, I didn’t do well, but what I learned could fill an encyclopedia. Here are a few of the tips I collected. That’s the author, showing poor form with support hand a little too far back and no lean into the gun. At shot five paid the price by having to take a step back and drop the last target. 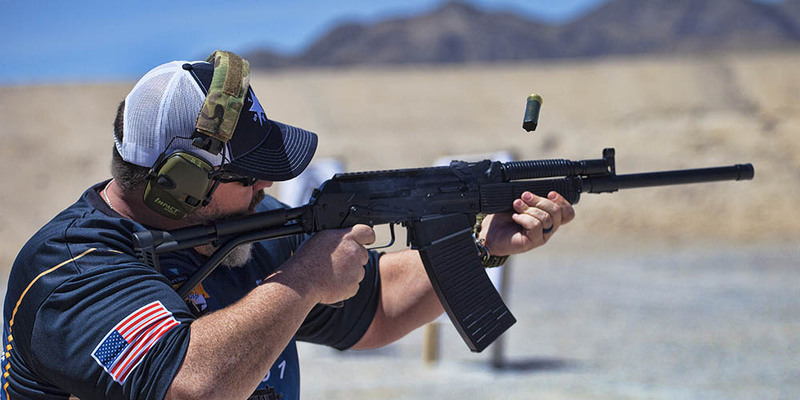 Robert Vogel, a 23-time national champing across three different disciplines of practical shooting, said a lot of the skills required to master your firearm can be practiced, polished and sped up at home. Naturally, safety is key, so remove all live ammunition from the area, and check and double check the gun in clear. 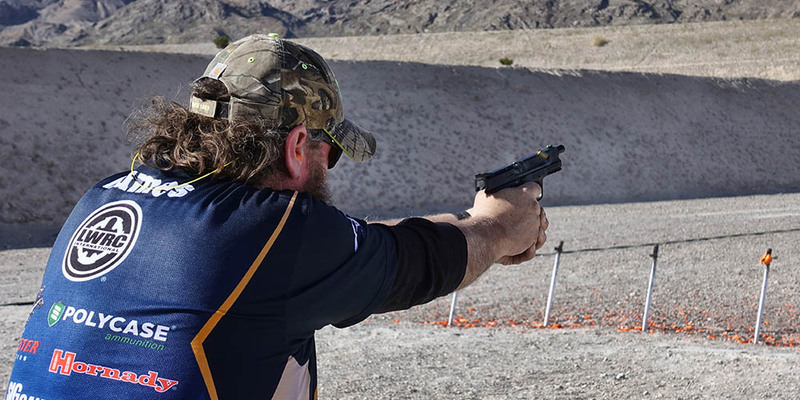 First, and foremost, he recommended, “Lots of dry fire…You can improve so much with dry fire.” In addition, practice “Correct gun handling at home.” For example, perfecting your draw doesn’t require and audience so long as you do it right. Perfect practice makes perfect, is the new-old saying, and repeating the same mistake over and over develops potentially dangerous incorrect muscle memory. Keep an eye on trigger finger placement as the gun is withdrawn from the holster. It stays firmly on the side of the gun until pointed downrange, not feeling around for the trigger. 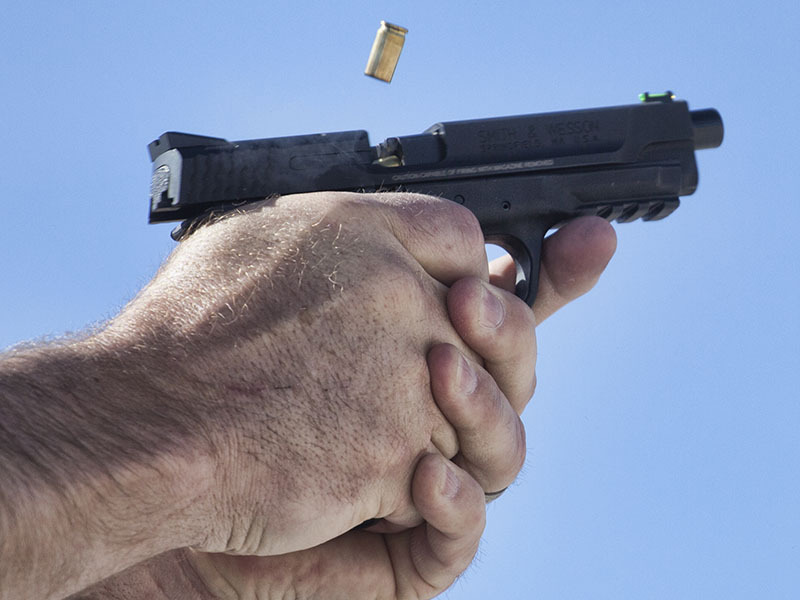 The same is true during holstering of a handgun, and never be in a hurry to re-holster anyway, regardless of the competition or self-defense scenario that’s developed. This is the second camp in which Dianna Muller has been an instructor. She saw a lot during her 22-year career with the Tulsa Police Department, but since retirement in 2014, she’s racked up trophies that include the 2016 USPSA Multigun Open Lady Champion and 2015 NRA World Shooting Lady Champion, among others. She offered the kind of common-sense advice you might expect from a law enforcement officer experienced at solving problems. She said there’s no need to rush out and buy all-new and expensive gear when you’re just starting. “Show up with what you have and with the heart to learn and understand,” she said. Most shooters are eager to help you learn the sport and get better by sharing their knowledge. 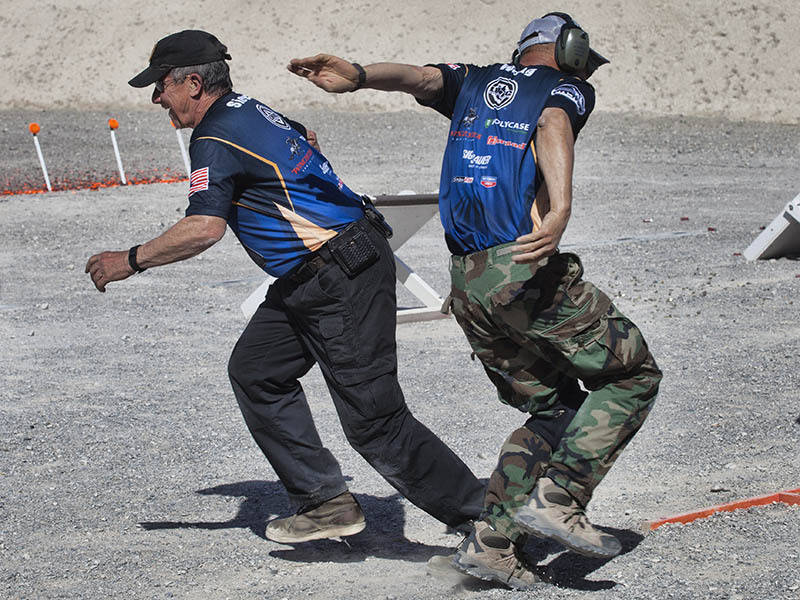 If you’re still worried about looking a little foolish from the lack of knowledge: “If you show up to reset and score, you’ll learn more about the game and the stress of working three firearms.” Matches always welcome volunteers, and a few even hold unofficial matches for their volunteers—to work out stage kinks—before competitors arrive. And keep notes. “Document your range time and your match time,” she said. “Document what you did well and what you need to work on.” I’d bet she didn’t like that kind of paperwork during her law enforcement career, but then again, it’s hard to find a casino that takes side wagers. Randi Rogers has been shooting competitively for 19 years and has won more than 50 world and national titles. She loves teaching because she gets to watch the “lightbulbs go on” in new shooters. Her slender build requires a handgun stance slightly different than many other shooters, and the approach seems ideal for someone with less than Olympic forearm strength—like me. “I need to have an aggressive, weight-forward stance,” she explained. “The more aggressively you lean into those firearms, the faster you can recover from recoil.” Feet are an arm length apart, weight on toes, bent knees, bent at the waist and show off your rear end by sticking it out to engage those leg and back muscles. The handgun stage she was teaching had five steel targets downrange. You were required to hit each of them, first from left to right. Then the sequence was right to left and finally from the back working your way forward. Naturally the shot clock was ticking and most of the campers were pretty fast during their initial run. But to demonstrate how the small things add up to a big difference, she had us firmly plant our feet at the firing line (using her stance). Then she grabbed the back of our belts, swinging our hips as we engaged. Times went down dramatically and I actually hit a few. Rotating at the hips is faster than multiple and distal adjustment in feet and legs. After hitting one, immediately turn your eyes to the next target, because the sights will follow. She had us dry-fire practice that several times and it is strange how the handgun mysteriously aligns on its own. Undoubtedly, Tommy Thacker is one of the nicest people in the entire industry. Don’t get me wrong, all the other instructors are wonderful, but when you’re not at the firing line or asking questions about shooting, Tommy talks about family, shares photos of his kids, asks about your loved ones and mutual friends. I became a fan when saw him tailgating with his entire family during lunch at a prestigious 3 gun match a few years ago. One of the campers was, by his own admission, “intimidated” at spending all of day two with the legendary Thacker, as he put it. His tune changed quickly and I heard the pair arranging to hook up at a competition later this year. 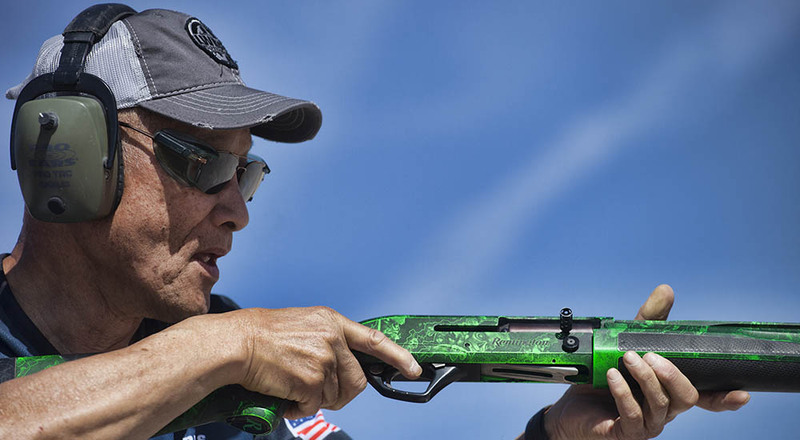 He was the 2011-2012 3-Gun Nation Champion, founder of Team ArmaLite and Team FNH USA, and his championships are too numerous to mention. He knows how to shoot and is eager to get others up and running. Thacker also understands a pro won’t be looking over your shoulder every time at the range, so he highly recommends critically critiques of your own performance. I was slower than usual with the AR-15 at 100 yards, and instead of telling me the errors, he politely inquired if I knew what I might be doing wrong. The list was long, and in hindsight easy to spot because he demonstrated the proper manipulation and approach beforehand at each stage as we rotated. Videotape yourself, work with a good shooting partner or ask for input and help from fellow competitors. It’s easy to go over the things we’re good at in practice. Instead, according to him, we should concentrate on the things we haven’t mastered. I’ve been a hunter for years, and from the sitting and kneeling position my left leg (support side) automatically comes up to help stabilize the rifle. From a barricade’s support, though, Thacker showed me how much more stable using that right leg—when I’m shooting right handed—makes the shot. It’s simple geometry, although even when using the support of a branch or rock, I never gave it a second thought. Once the shot clock started during the camp’s competition, I naturally forgot and was slow with the AR-15. Perfect practice builds the right muscle memory, so I have some work to do. Most action sports don’t give extra points for dead center hits on the target. Because of that fact, when transitioning for the next shot, squeeze the trigger just as the sights move onto the steel, he advised. If you wait until they pass over the center you maximize the chance of a miss and risk losing time while returning to re-engage or a penalty. This is particularly true with shotgun, and there’s where I noticed the improvement most. And extend your arm on that AR-15 so you can drive it to the next target. Holds in close the mag well don’t maximize that ability and require some sort of regrip when using your support hand to anchor onto a barricade. 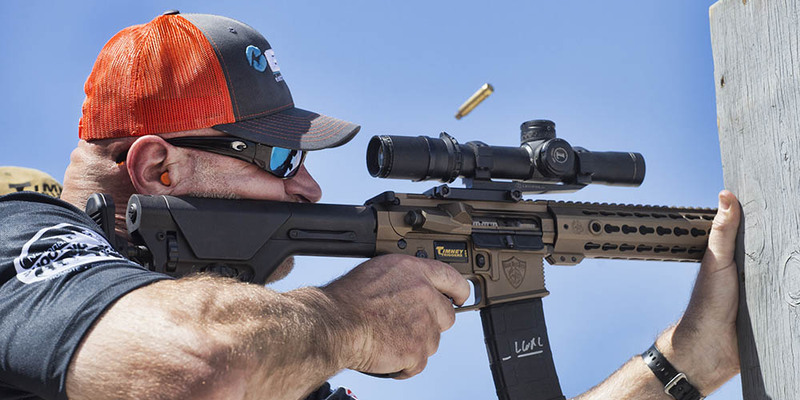 Wrap that thumb around the fore-end and point the index finger downrange….ensuring nothing goes in front of the muzzle or touches the barrel, naturally. It sounds like a lot, but all are simple, easy to practice and add up to better scores. Instead of being shy about registering for a match, “Get out of your comfort zone and show up,” Vogel advised. If the friendly shooters I met at camp are any indication, you’ll be glad you did. Profiling Is NOT A Dirty Word!